Cyber security firm Kaspersky has released an interactive chart to display a list of known targeted cyberattacks. 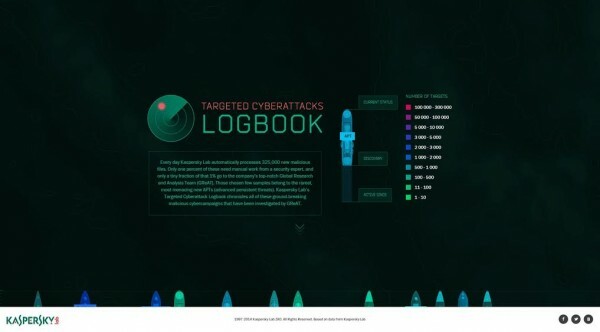 The targeted cyber attacks logbook project displays the company’s research and analysis, providing a more visual representation of the online threats at large in the world. The chart doesn’t actually cover all known threats, as it only includes the work done by the Global Research and Analysis Team; which is less than 1-percent of all malware detected by Kaspersky. At the moment, only 29 threats are documented on the chart; although it shows all the big ones like Regin, Dark Hotel, Stuxnet, and Duqu. Each cyberattack is displayed on the timeline in the form of a ship: the bigger the vessel, the longer the attack has been in operation. 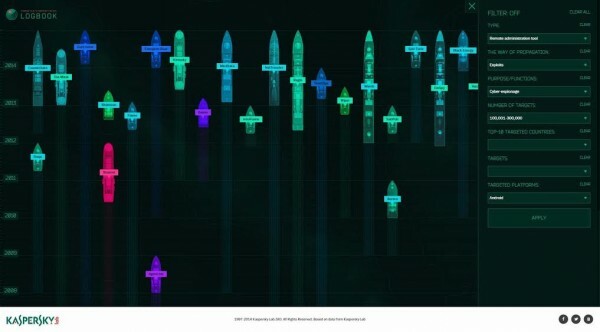 The wake behind the ship shows the time from the detection of the first malware samples to the publication of the results of the research project, while the color gradient indicates the number of victims. Clicking on the ships will also bring up more information about the particular cyber-attack, like which countries are being targeted, the affected platforms, and how it spreads. It is an interesting way to get a general feel of each of the cyber attacks currently at large in the world, although it isn’t precisely useful as a reference guide. At worst, it could be useful for IT departments to show their bosses just what they should be prepared for. Those interested in spending a couple of hours flipping through malware can find the Kaspersky Targeted Cyberattack Logbook here.